Nice Drama-comedy - Slice of Life with Slow Romance and a magic-Fantasy at the end of each volume. It's so good that with the secret revealed little by little gradually I think it's alright even if it's turn into more serious Fantasy. And the author didn't disappoint me, later on it will become more serious, while still... more>> maintaining Drama-comedy - Slice of Life. For the romance part, (even though I could count as anti main heroine type), but gradually the main heroine in this novel become my favorite. I like the slow romance, little by little the heroine open up, and eventually growing fondness for MC. Calling this light novel as underated would be sinfully understated. That, of course, stems from this being licensed. The amount of quality content is so ludicrously enormous, that it took 2 Volumes out of the 12 Volumes present, to deliver a full-blown 12 episode anime. Which was, btw by no means slowly paced. A near perfect blend between comedy, suspense and Romance in a well-written plot. Slice of life or action, both of them done right. Frankly, this has the best love triangle I've seen. so far, in this genre.... more>> The fact that 'Fictional characters' could be as reasonable as this, came as a pleasant surprise to me. Epic. The likes of other light novels like Tate no yuush or Zero no tsukaima, simply are appear inferior to me, after having my venture into this one. But what makes this novel special, is it's absolutely lively and well-fleshed out Plethora of Characters. None of them are bland. Whether it's primary main characters of Maou, Emi and Chi or just minutely secondary characters like Ashia, Rika or Lucifer etc... each and everyone of them, is a harmonious resonance between modern day reality and there fantasical alter-egos. Finally, I would like to express my thanks to mittens220 for their awesome decision to translate this. This is one of the best light novel I ever read. The comedy is really good to make the reader hooked on it. The romance is slow but sure that make the heroine in this novel become lovable. The side character did not bland so we can tell all their characteristic include the enemy. The drama about how the hero and demon king interact to each other in social world really interesting and how they face enemy together really good too. 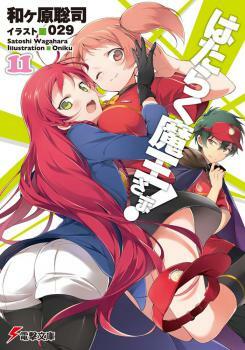 Overall, this is one of the best light novel drama-romance-comedy... more>> to read.